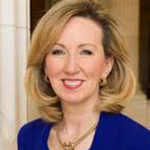 Former Virginia Congresswoman Barbara Comstock, who lost her seat in 2018 to underdog Democrat Jennifer Wexton, has joined Baker Donelson as senior advisor in its government relations and public policy group. Before first being elected to Congress in 2014, Comstock was running Corallo Comstock PA firm with Mark Corallo. Both had worked as spokespeople in John Ashcroft's Justice Dept. As director of the office of public affairs, Comstock handled communications for terrorism investigations, corporate fraud and antitrust matters. Sheila Burke, who chairs BD's government relations and public policy group, praised Comstock's "in-depth understanding of federal policymaking" and "commitment to bipartisan cooperation." She served 19 years on Capitol Hill, which included a stint as chief of staff to then-Senate Majority Leader Bob Dole.